Diego is one of our bilingual associates, fluent in Spanish and English. 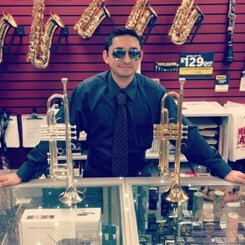 Diego started playing Trumpet ever since he was in 6th grade attending Clifton M.S. He then attended Waltrip H.S. and picked up the French Horn his Sophomore year. He is a 3 time State Soloist recieving 3 Gold medals from the University of Texas his 10th,11th, and 12th grade year. He was a part of the All-City Band ever since his 10th grade year and was First Chair Trumpet for the Region band and 3rd Chair for the Region Jazz Band his Senior year. He was a student leader in his band, being the Head Drum Major his last year at Waltrip. He now attends College Full-Time and wants to become an Educator in hopes that he gets the chance to impact and motivate the student youth, the same way Teachers have impacted him.